The highly anticipated third edition of the essential textbook in the field of blindness and visual impairment is completely revised and updated for the 21st century. In addition to the latest information and best practices, Volume I, History and Theory of Teaching Children and Youth with Visual Impairments, includes a whole new set of chapters that provide additional perspectives on the educational system and focus on crucial topics that connect the education of students with visual impairment to the broader context of educational theory. 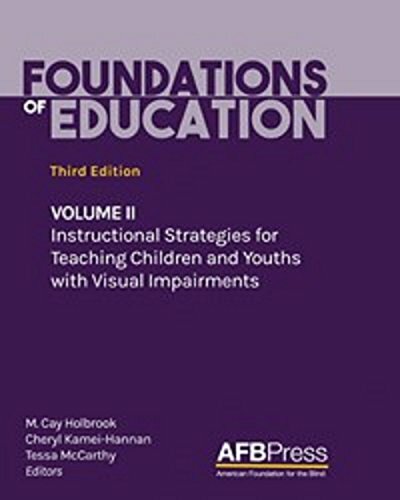 Volume II, Instructional Strategies for Teaching Children and Youths with Visual Impairments, contains additional material on planning instruction, moving from assessment to instruction, and supporting students with visual impairments in the general education classroom Instructional strategies are also highlighted, with chapters dedicated to each area of the core or expanded core curriculum. Icons located throughout both volumes direct readers to audio introductions, chapter overviews, learning activities, videos, resource lists, and downloadable forms housed in an exclusive, web-based Learning Center that enriches this foundational textbook as never before.